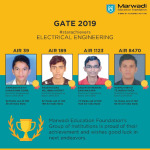 Students of Electrical Engineering have performed well in GATE 2019 examination. Department of Electrical Engineering of MEFGI wishes congratulation to all students. Aniruddhasinh Gohil had secured 39 All India Rank (AIR) with score of 92 marks out of 100. He was student of 2014-2018 batch. Krushnadas Korat had secured 189 All India Rank (AIR) with score of 87 marks out of 100. He was student of 2013-2017 batch. Sagar Sankhavara had secured 1123 All India Rank (AIR) with score of 77 marks out of 100. He was student of 2014-2018 batch. Hasmukh Vaza had secured 8470 All India Rank (AIR) with score of 52 marks out of 100. He was student of 2015-2019 batch. Marwadi Education Foundation’s Group of Institutions is proud of their achievements and wishes good luck in next endeavors.